I’m all about brevity when it comes to recipe titles. If I were naming this dish for a restaurant menu, it would be lamb meatballs: cucumber tzatziki. You see, I love the element of surprise, and, as it turns out, the eggplant in this recipe is a wonderful surprise. It’s doused with olive oil, sprinkled with salt and placed on the grill, where it sizzles and pops to a deep golden brown, all smoky and crispy and charred. 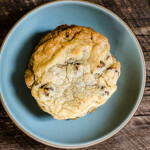 Once it cools slightly, the inside is as creamy as the outside is crisp. Covered with cooling cucumber yogurt sauce, it steals the show from some dynamite, juicy lamb meatballs studded with garlic and herbs. The afterthought here turned into the unsung hero. It would be fun, as a restaurant chef, to leave the eggplant part out, so the customer expects lamb meatballs and some tangy sauce, but gets so much more. My husband calls this managing expectations. I call it intentional omission with the best possible outcome – a pleasantly surprised customer (or wife) – so it doesn’t really bother me when he does it. From a blogging perspective, this is not really a great strategy. My job is to assault your senses, through words and pictures, so you can’t help but put down that three-year-old, bestselling beach read, or dash out of that meeting, and sprint straight to the grocery store to buy the ingredients for dinner TONIGHT. Mystery and Dinner don’t belong in the same sentence when we’re dealing with a hungry family. 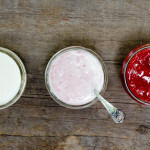 The recipe needs to exactly as you expected and, of course, delicious, so you want to cook it again and again, for the flavors and the satisfaction of getting it right, of seeing sated, smiling faces around your kitchen table time after time. So, at the risk of appearing predictable, I leave you with an informative title that snakes around to a second line, and a recipe that (sans surprises) still manages to exceed expectations. If grilling isn't an option, place the skewers under the broiler (about 8 inches from the heat source) and cook as indicated in the grilling instructions. 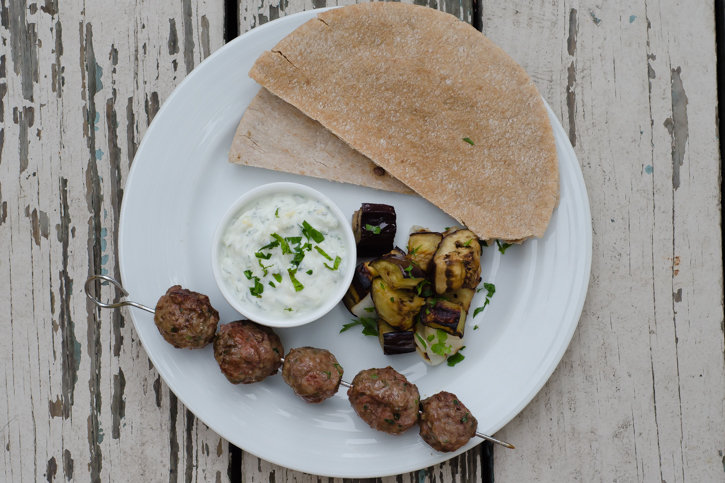 The meatballs and vegetables taste great piled into warm pita bread or served alongside the dipping sauce as an appetizer or gluten-free meal. Serve with a mediterranean orzo salad or crisp Greek salad. 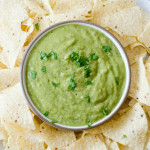 The cucumber sauce can be assembled and refrigerated from 15 minutes to 4 hours in advance. Stir before serving because the water from the cucumber will loosen up the thick yogurt. Sauce yields 1 cup, or about 8 servings. 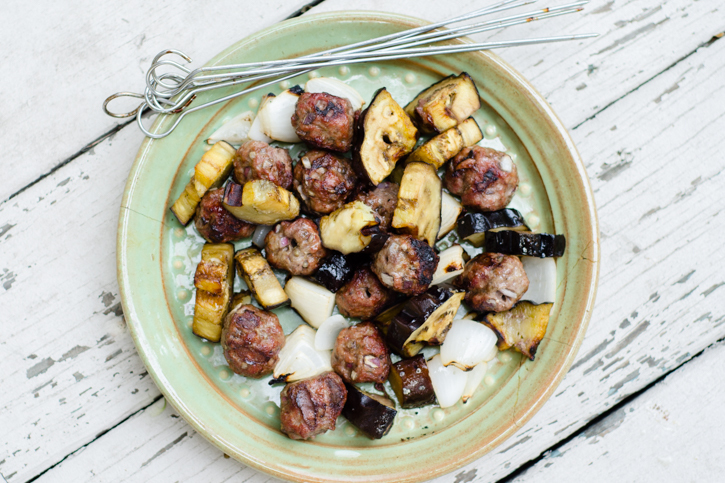 Use leftovers on just about anything - lamb, chicken, beef, fish, falafel or veggie burgers. For a variation that tastes great over grilled or poached salmon, substitute 1 tablespoon dill for the mint and 2 tablespoons chives for the parsley. Preheat the grill over medium heat (about 375 to 400 degrees), or turn on the broiler, adjusting your oven rack so it is 6 to 8 inches from the heat source. Grate the quartered cucumber on the large holes of a box grater (careful not to grate your fingers) and set aside in a small bowl. In a medium bowl, combine the shallot, lemon juice, lemon zest, salt, and pepper and let sit for five minutes. Add the herbs and yogurt and stir to combine. Fold the cucumber into the sauce and refrigerate until ready to serve. The sauce can be assembled and refrigerated from 15 minutes to 4 hours in advance. The water from the cucumbers dilutes the yogurt a bit and makes it a more fluid topping. Stir gently a few times before serving and adjust salt and pepper to taste. In a medium bowl, combine the lamb with the rest of the meatball ingredients and mix with your hands to combine. Divide into 16 meatballs, about 1 ounce each. 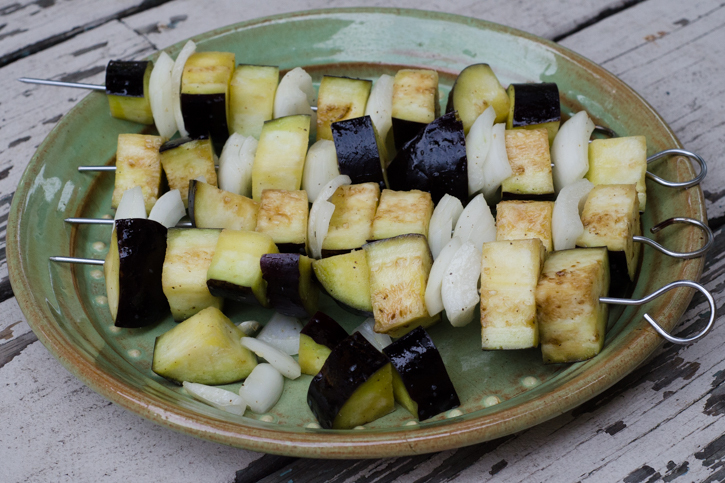 In another medium bowl, chop the onions and eggplant into 2 to 3-inch chunks and toss with the olive oil and salt. Thread the lamb and vegetables onto separate skewers. It's important that the meatballs aren't squished together on the skewer. Allow for some space between each one or they won't brown well and will take longer to cook. 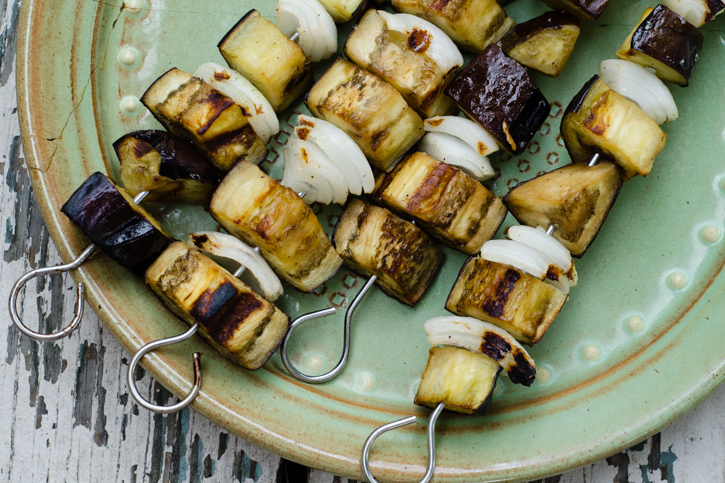 Place the skewers on clean, oiled grill grates or on a baking sheet and slide them under the broiler. 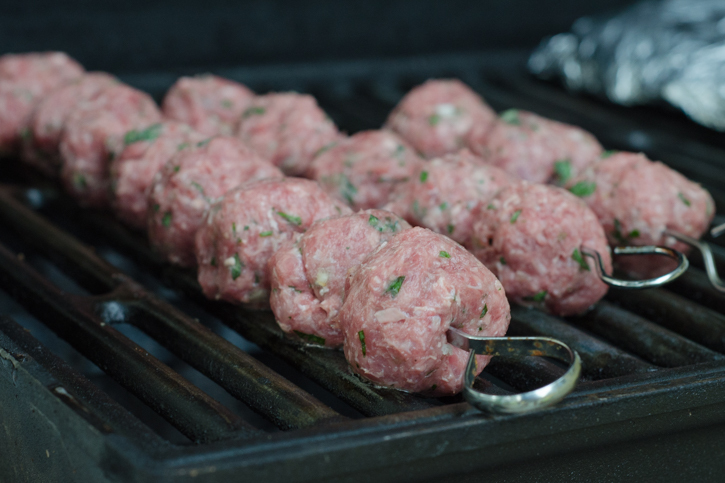 Grill/roast the meatballs for four minutes, turn and repeat on the opposite side. Grill the vegetables for 5 to 6 minutes per side, or until they are turning golden brown, charred in spots, and slightly crispy, about 12 minutes total. Remove the skewers to a plate and allow them to cool slightly. 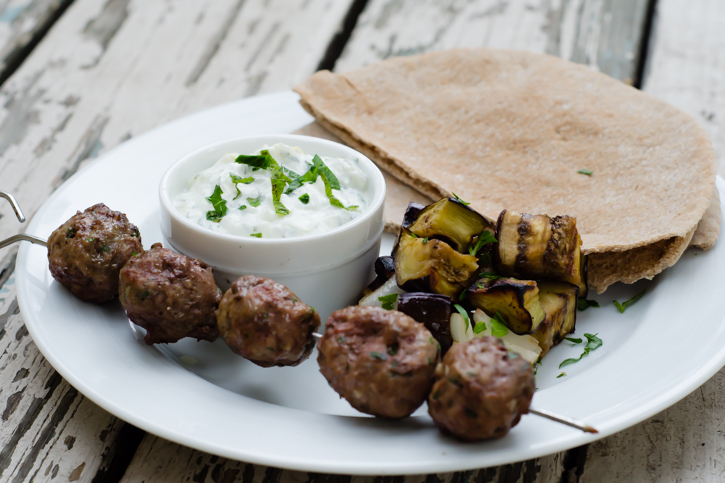 Serve the meatballs and vegetables either on or off the skewers with the cucumber yogurt sauce and warm pita bread for stuffing (if desired). Coral: I don’t mind at all, as long as you link back to the site when you mention my recipes or photographs. Thanks for visiting!